The Farmers Wife: She's Here!!! Hey y'all! It's been a couple weeks since I posted a new recipe, in fact the last one was posted while I was in labor with our sweet baby girl! Meet Nichole!!! Nikki a pretty easy going baby. Rarely is she overly upset, if she's really gassy or is getting her diaper changed are about it, otherwise she is the most laid back baby I've ever seen. 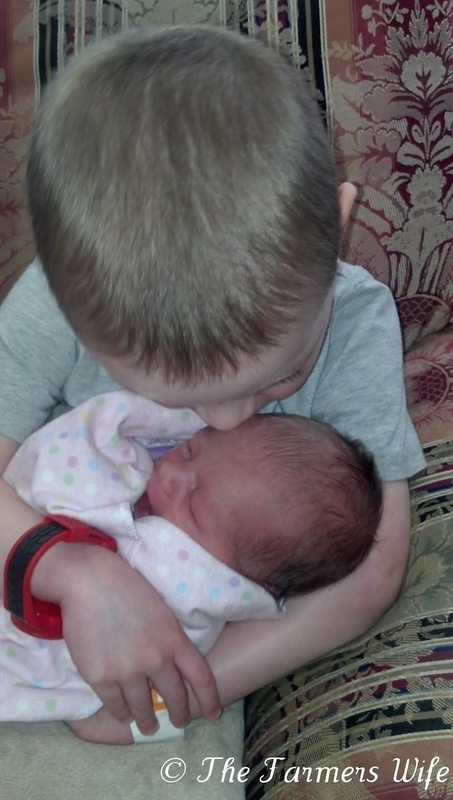 Josh is absolutely in love with his sister too, loves holding her and kissing her. I've pumped a few bottles and he's gotten to feed her which he just loves doing. Labor was definitely different this time around, being induced was a different experience but they say I handled it well and even still was only in labor for a little over 13 hours (Josh was 9 hours) which is very quick for an induction, and I only pushed for 12 minutes!!! They started me on a pill called Cytotec to induce and then had me walking for about 2 hours. That brought on some pretty strong contractions, about 2 minutes apart lasting about 45-60 seconds a piece. Finally they gave me an epidural, and my midwife (who was FANTASTIC!) broke my water and with the help of pitocin I progressed very quickly from that point on. In fact it probably would've been less time except my nurse forgot to check me at one of my position changes, and when she checked 45 minutes later babies head was right there. haha! 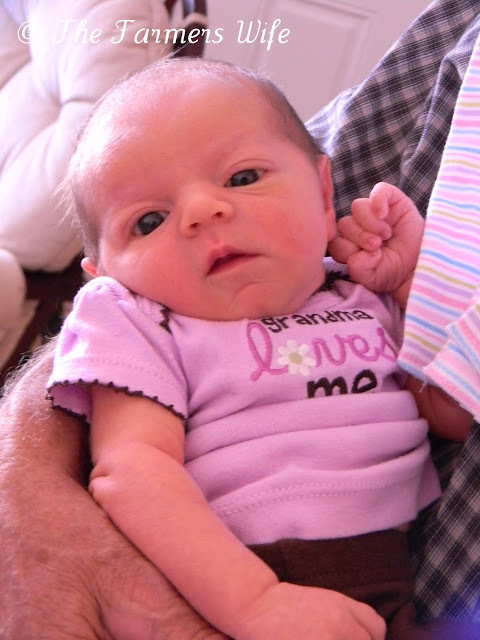 She was telling me not to cough, sneeze, laugh nothing til my midwife got there. My midwife must've ran every red light possible because she was there within minutes. And with my midwife, nurse and Jeremy being the only ones in the room it was actually almost a fun birthing experience. It was so relaxed, I was able to push when I felt I needed to. It was such a different experience from Josh, and I'm so glad. They were cracking jokes the whole time, Jeremy was supporting my head so I could breathe easily, I'm really happy with how everything went. And she's so healthy and happy. She's a tiny little thing too, weighing 6 lbs. 4oz at birth and 19 inches long. She is a fantastic nurser as well, within an hour after birth she started eating and ate for almost an hour straight amazing both us and the nurses. And we were released in less than 24 hours too, for the most part Nikki is a wonderful sleeper at night only getting up once at night to eat! We are really enjoying our baby girl and I'm so glad to be able to finally share our birth story and that she is finally here!! 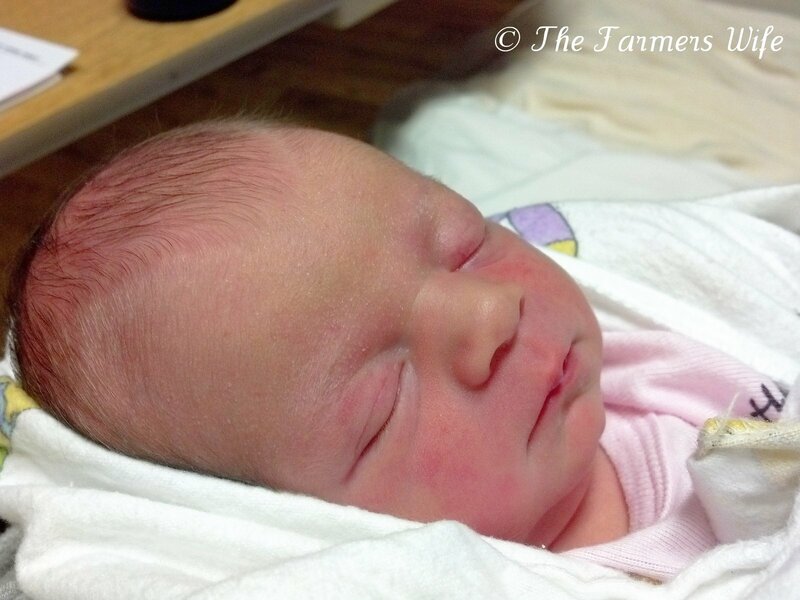 Congratulations on your new baby girl!! Enjoy! They grow up so fast! My "baby" is now 19 and recently joined the Navy. Love looking at the baby pictures, they bring back so many good memories. Congrats on your new little girl!! That first picture is so sweet! Well I don't know if you have time to read this now but she is the best recipe ever! Wishing you and your family all the best, health and happiness hugs from Pauline aka Mrs Mulford .